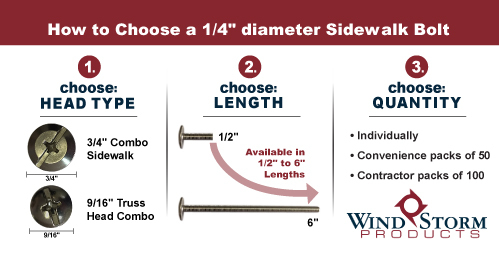 1/4"-20 Combo Sidewalk Bolts are used to install Plywood, Metal, and Fabric Hurricane Panels or removable track. Stainless steel construction with a #3 Phillips combination head. Perfect Replacement for "Stripped Out Heads"
Combo Sidewalk Bolts are 18-8 Stainless steel construction with a #3 Phillips combination head.